The Database Dashboard was the last legacy interface left to be upgraded. 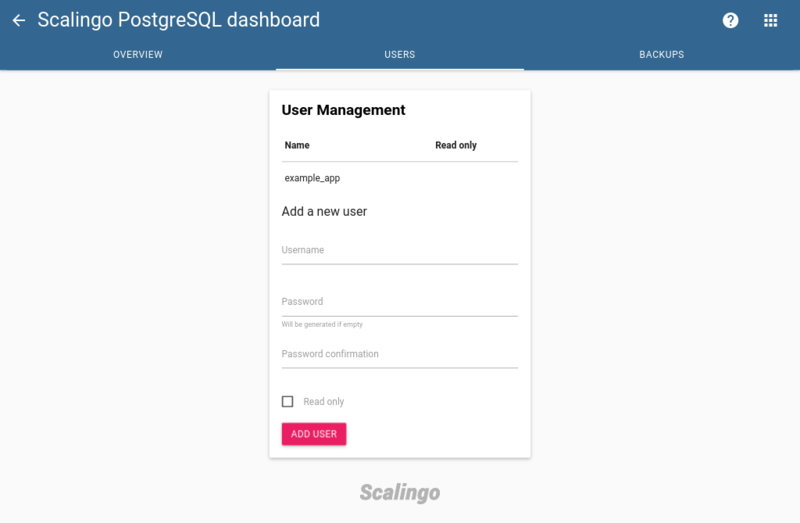 It was part of the old Scalingo Dashboard, now it finally receives the love it deserved with a revamped design and features including database statistics! Adding new features along the way, we made sure it has the same design language than other Scalingo websites. Every feature you were using is available with a better interface. The following addons now have access to its new dashboard. This section displays several information. The Stats section is divided into 2 areas, the first one is the system stats and the second is database specific stats. In the system stats you will find the current CPU , RAM and SWAP usage of your container. It will also tell you what is the maximum RAM and SWAP reached. So, you can have a sense of the overall consumption and decide whether upgrading to a higher database plan or not. The database stats displays the data size reported by your database and also the physical disk size that is actually allocated. Some database have specific stats, such as MongoDB with the index size , MySQL with the number of connections. This feature is only available to databases that have a clear authentication requirement, namely MongoDB, MySQL and PostgreSQL. Users management allows you to add and delete users from your database. By default, when you provision a new database addon a user with the ID of the addon is added. Database users can be read-only if you need them to be. When creating a new user you can leave the password field empty, our system will generate a strong password for you. For paid database addons, automated backups are made periodically on a daily basis , with the following retention policy: all backups are kept for one month, then one per week for the 2nd and 3rd month, and finally one per month for the 4th, 5th and 6th month. In total, 41 backups are available to you. You can read more in the Documentation Center. 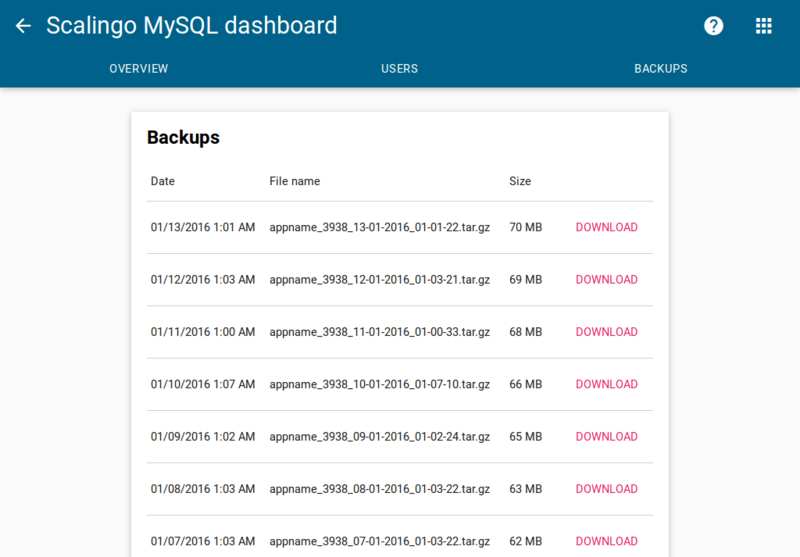 To download your backups, head over to the Backups tab of Database Dashboard. 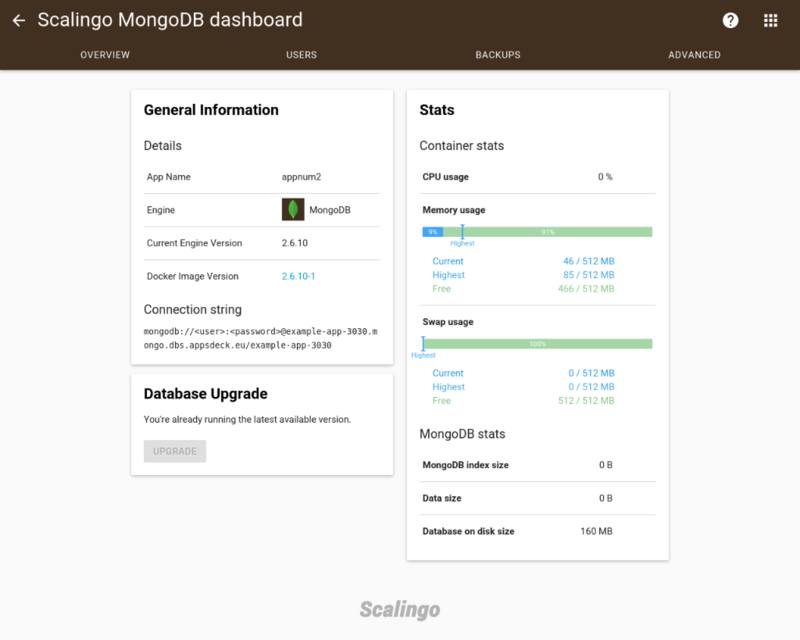 Currently MongoDB has an advanced feature called Oplog. Meteor uses Oplog to increase performance and keep real-time synchronization when scaling applications. With Oplog enabled, a Meteor app can get real-time database updates from MongoDB instead of polling it. Because of this, Oplog is really useful to Meteor users, so make sure it is activated by going to the Advanced tab on the MongoDB Dashboard. PostgreSQL extensions are scripts that once enabled will give your database new features such as hstore (hash maps), postgis (geographic objects) and uuid-ossp (UUID generation). 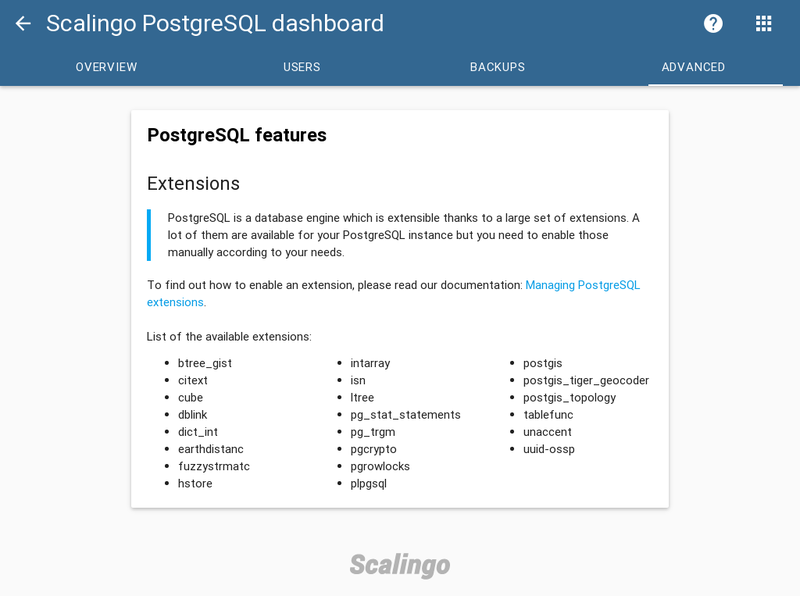 The list of extensions available on Scalingo can be found in the Advanced tab of your PostgreSQL Dashboard. To enable an extension please refer to Managing PostgreSQL extensions documentation. Another advanced feature is the Database Upgrade in the Overview tab. When the database vendor releases a new version, we will provide it as soon as possible and you can choose to upgrade with just one click. The upgrade process is fast and entirely automated thanks to our infrastructure based on Docker containers. The first step was to make the Database Dashboard more usable and prettier. In the coming months, we will be adding new features to give you more control over your databases and make this part of API public. You will be able to select the version of database you want to upgrade to, choose the time of day the backups will be done and when automated upgrade will be made.